Social media is a tricky thing which is why large businesses higher people that focus solely on managing Twitter, Facebook, and Google+ accounts. 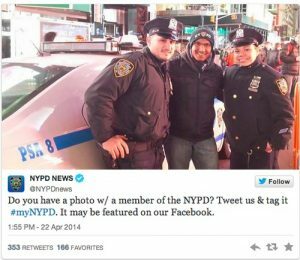 On Tuesday, the New York Police Department (NYPD) attempted to run a campaign where it asked its followers to send in pictures of themselves with police officers. When the NYPD’s social media team chose to send out the initial tweet with its #myNYPD hashtag, it was likely planning to receive a bunch of photos with smiling citizens and police officers. However, what it actually got was entirely different. Shortly after the tweet went out, hundreds of people took over the hashtag and used it to tweet out photos of NYPD officers allegedely abusing their power and hurting people for no apparent reason. Even if the police officers in the photos were completely justified in their actions, the photos simply add to the NYPD’s already bad reputation. Horrible programs like Stop and Frisk combined with a general authoritarian outlook has resulted in large police departments like the NYPD being thought of as the enemy by many young people. Considering that the majority of people on Twitter are young and many of them also have had bad experiences with the police, the social media campaign was a recipe for disaster. Some Twitter users did post positive photos of themselves with officers but overall, the #myNYPD hashtag was filed with exactly the opposite of what the NYPD social media team was hoping for. This is not the first time that social media campaigns on Twitter, Facebook, Reddit, etc, have gone horribly wrong but it is the most recent. If there is anything that individuals or organizations should take away from the NYPD’s failure, it is to be careful when using social media if you are dealing with an already damaged brand. Summary: The NYPD started a social media campaign on Twitter, asking people to post photos of themselves with officers. The majority of posts were of alleged police brutality, showing how social media campaigns can quickly backfire.